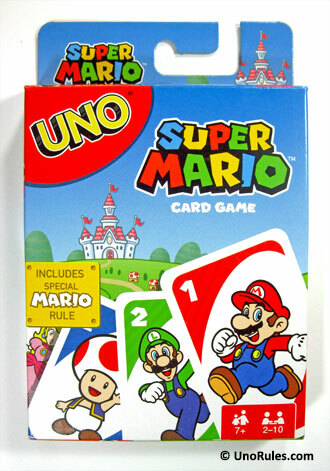 Uno Super Mario is based on the popular Super Mario platform game character by Nintendo. Anyone who has ever played Nintendo games would be familiar with the Super Mario franchise featuring the hero Mario, and his brother Luigi. 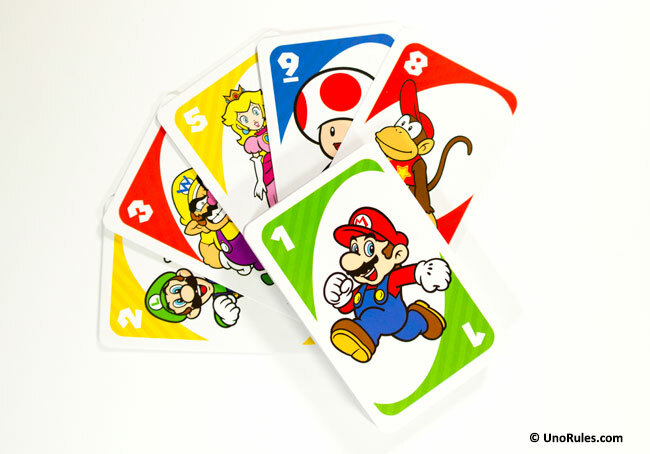 All the main characters of Super Mario are shown on the card design of Uno Super Mario, along with a new special Action card. Get rid of all your cards and be the first person to accumulate 500 points (or whichever number all the players mutually agree upon). 2-10 players may take part. Choose a dealer first. Shuffle the cards thoroughly and then each player draws a card from the deck. The one who draws the highest number card becomes the dealer (regard all action cards with no number on them as zero). The dealer shuffles the cards and deals out 7 cards to each player. The remaining cards are placed face down to form the Draw pile. The first card from the Draw pile is then turned up to form the Discard pile. If the first card turned up is not a number card but an Action card, please see below on what to do. Play can now begin. Traditionally, the player to the dealer’s left starts play, and the turn rotation moves in a clockwise direction (until it gets changed by a Reverse card). Players need to match the top card shown on the Discard pile by color, number, or symbol (in the case of the Action cards). For example, if the top card on the Discard pile is a red 5, then you can play a red card, or a number 5 card of any color. If the top card on the Discard pile is a red Reverse card, you can play a red card or Reverse of any color on top of that red Reverse. Same goes for the other Action cards. Players can choose not to play any card on their turn. If so, they must draw a new card from the Draw pile. If you don’t have any suitable card to match the card on the Discard pile, you will also need to draw a new card from the Draw pile. If that card can be played, then you can either play it or keep it for a future turn. In this manner, play moves from player to player, with each player trying to get rid of all their cards before the others do. From left to right: Skip, Reverse, and Draw Two cards. Whoever plays a Skip will force the next player to lose their turn. This card can only be played on a matching color card or another Skip of any color. If turned up at the start of play, that first player to the dealer’s left must skip their turn and the next player gets to go first. A Reverse changes the direction of the play. So if the direction was clockwise, then a Reverse, changes the direction to counter clockwise – until another Reverse changes it again. This card may only be played on a matching color card, or another Reverse. If turned up at the start of play, the dealer goes first, followed by the player on the dealer’s right, in a counter clockwise direction. When you play a Draw Two card, the next player must draw two cards from the Draw pile and skip their turn. Draw Twos can only be played on a card with the same color, or on another Draw Two. If this card is turned up at the start of the game, the first player must unfortunately draw two cards from the Draw pile and skip his/her turn. From left to right: Wild Draw Four, Wild card, Wild Customizable card, and Super Star card. This card enables you to choose what color you want the play to continue with. Just play the card and announce what color you want it to be. You can play this card on any color, and also choose any color you wish. If a Wild card is turned up at the start, the first player gets to choose what color to continue play. When you play this card, you get to choose what color you want to continue with, and also force the next player to draw 4 cards and skip their turn. Unlike the normal Wild card though, you can only play this card on your turn when you don’t have a card of the same color as the one on the Discard pile. You can STILL play this card if you insist, but the next player is allowed to challenge you to show your hand. If you have a card that matches the color of the one on the Discard pile, then you will be penalized by drawing 4 cards from the Draw pile. But if the challenge fails, and you really don’t have a card of the same color, the other player who challenged you must draw 6 cards! If turned up at the start of play, return this card to the Draw pile, and turn up another card. This card allows you to write any house rules on it as long as the other players agree. Use a soft pencil for writing on it (the cards are erasable though). For example, you can write on it “Run a lap around the living room", and when played, the next player must then run a lap around the living room. It is a Wild card, so you get to choose the color that continues play. If turned up at the start, the first player gets to choose the color. 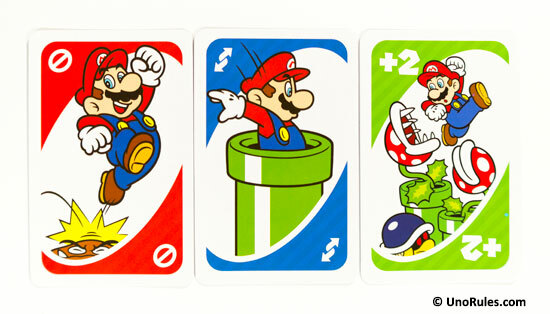 This is the special card of Uno Super Mario. This card reverses the effect of any Draw Two or Wild Draw Four cards played on you, and forces the player who played it on you to draw two or four cards instead! This is a Wild card in itself, so you can use it as a Wild card (see above). If turned up at the start, the first player gets to choose what color to continue play. When you have 2 cards left and are about to play your next-to-last card, remember to yell “Uno"! Fail to do so before the next player begins their turn, and someone might notice it and catch you. If caught, you must draw two cards as penalty. You win the round by discarding all your cards before the others. If your last card played is a Draw Two or Wild Draw Four, the next player still needs to draw those cards for scoring purposes, even though the round would end. If the Draw pile is depleted and no one has gone out yet, take the Discard pile, shuffle it, and turn it face down to become a new Draw pile. Add up the points corresponding to the cards left in each player’s hand at the end of each round, which goes to the winner of the round (first person to go out). The champion is the first person to reach 500 points or more. However, you can set a lower or higher figure as long as everyone agrees to it. An alternative method suggested by Mattel to win the game is to keep a running tally of the points each player has at the end of every round. When somebody reaches 500 points, the player with the lowest points is declared the winner.